It's still early to see a clear picture about where Torrey Smith cards are headed. One of Joe Flacco's deep threats, the wide receiver has the potential to break any game open. In just his second season, Smith finds himself in the Super Bowl, one of many standouts of a strong Ravens team. It's on that stage that Torrey Smith cards could break out, at least in the short term. But even if he comes up short, there's still a lot of room for stable, long-term hobby growth in the years to come. The Ravens picked Torrey Smith in the second round of the 2011 NFL Draft. He spent his college years at the University of Maryland. His first three NFL receptions just happened to be touchdowns. Smith finished his rookie season with 50 receptions for 841 yards and seven touchdowns. His numbers were nearly identical in 2012. 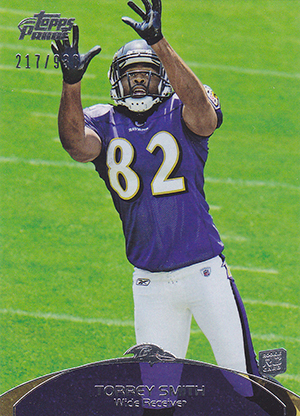 Collectors have plenty of options when it comes to Torrey Smith rookie cards, especially if they're fans of autographs. There are more than 30 first-year Torrey Smith cards to chase, plus hundreds of parallels and inserts. The majority of his rookies are high-end cards that come with relatively low serial numbering, autographs and, often, memorabilia swatches. 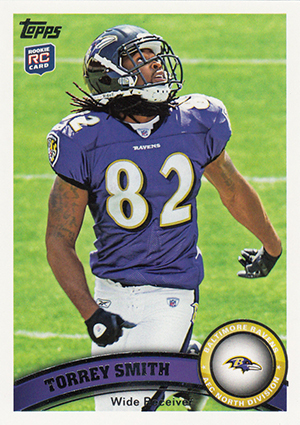 Most Torrey Smith cards remain affordable as collectors are still wondering about his long-term success. This means there is some risk, but it's a calculated one. 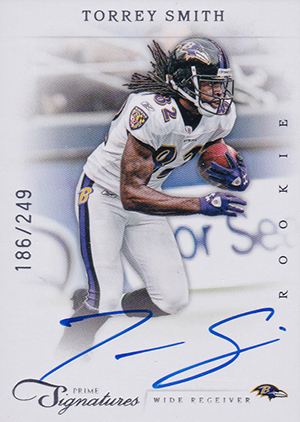 Another very popular early Torrey Smith card is his Rookie Auto Patch from 2011 Upper Deck Exquisite. Numbered to 135, the card comes signed on-card with a patch swatch from a player-worn jersey. The card is licensed by the NCAA and not the NFL. Below you will find an example of what Torrey Smith's authentic signature looks like. This can be used as a first point of reference for determining the legitimacy of autograph memorabilia, but is not a substitute for having your items authenticated by a well-respected professional autograph authentication company.